If you were to ask me what I’d choose to eat for dessert, I will always say some sort of chocolate. Whenever we go out to eat, I always look at the dessert menu first. I need to know what to save room in my stomach for, you know?! If there’s anything chocolate on the menu — and there usually is — I usually always choose that. My favorite is a super decadent chocolate cake but I will also take any type of chocolate dessert. 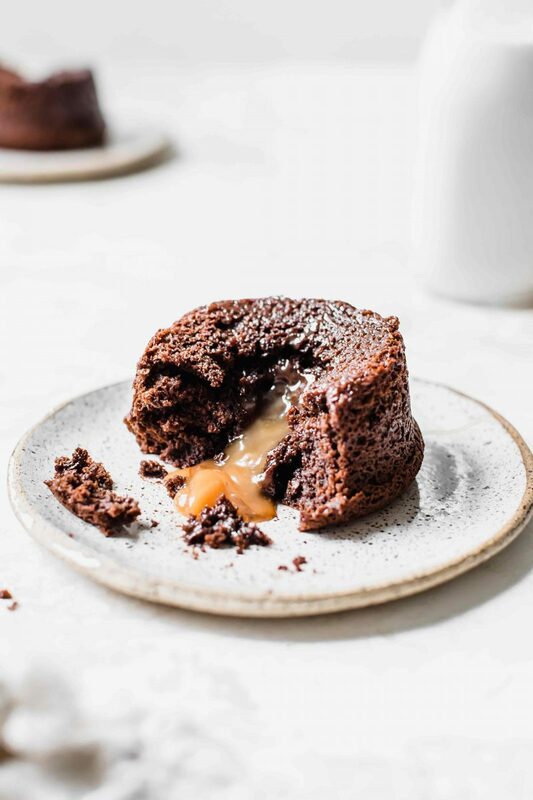 I feel like molten lava cake is a very popular one to have on menus but I’ve always dreamed about making it at home myself. Insert salted caramel molten lava cakes. 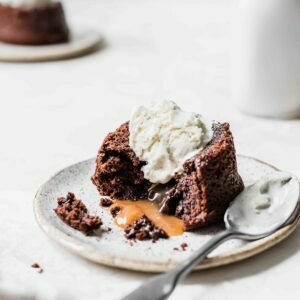 What is a molten lava cake? 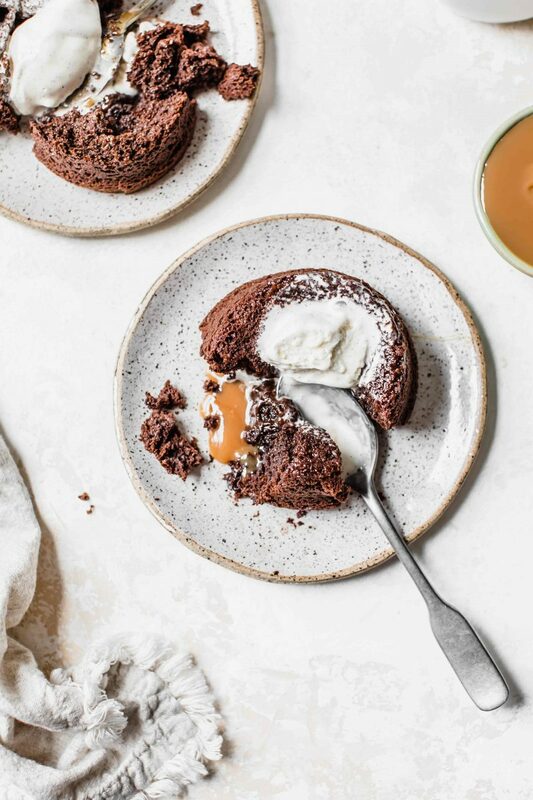 A molten lava cake is kind of like emulating a volcano. 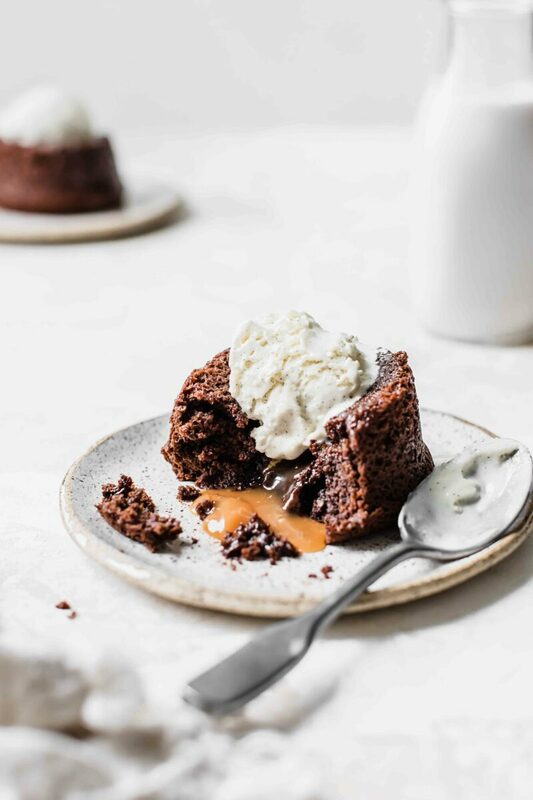 Hot, gooey chocolate liquid is in the center of the half-baked cake and when you slice it in half, it all oozes out into a river of chocolate goodness. You’ve cooked it too long! You need to cook it JUST until the center is slightly jiggly and then immediately pull it out of the oven otherwise it’ll keep baking. That’s probably because it was not structurally cooked enough. The sides may have looked cooked but it couldn’t structurally hold itself when you inverted it. You can make this with semisweet chocolate chips, if you prefer or milk chocolate. What can I serve this with? A giant scoop of ice cream on top, DUH! Do I have to use the salted caramel? No, you certainly don’t have to but that’s a third of the goodness, isn’t it?! You can make the batter ahead of time but no, this cake needs to be made and eaten immediately. So I can’t freeze it. The perfect treat for you and yours on any night of the week! Place a heat-proof glass bowl over a pot of simmering water or use a double-boiler. Melt chocolate and butter together then remove from heat. 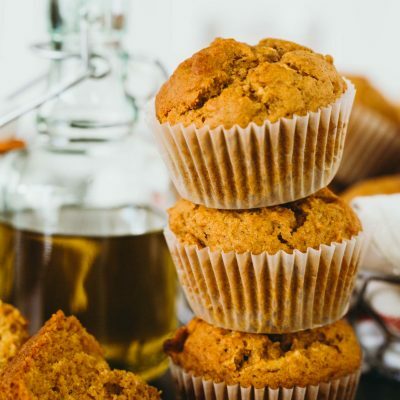 In a small bowl, whisk together sugar, flour, and baking powder. Add egg, milk, and vanilla extract to the chocolate mixture. Whisk to incorporate. Add the dry mixture to the wet mixture then whisk until fully incorporated. Divide batter amongst 2 well-greased 6-ounce ramekins. 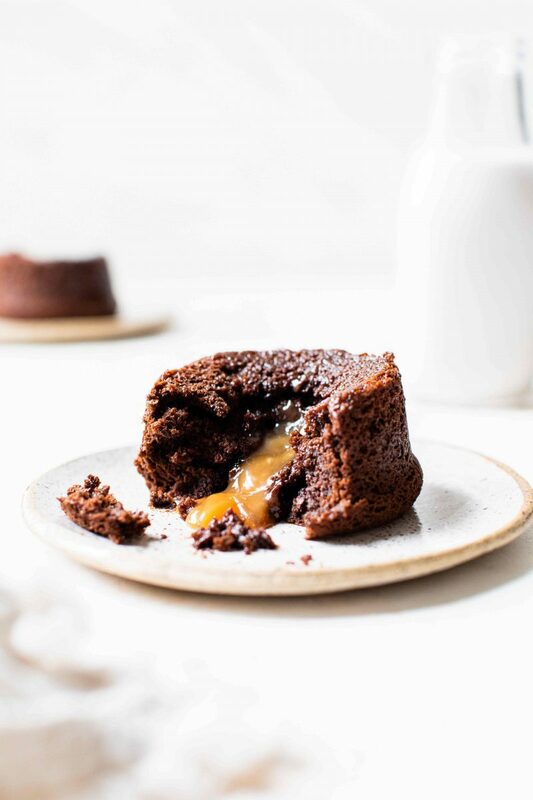 Add 1 teaspoon of salted caramel into the center of the batter in each ramekin. Bake for 13-15 minutes or until the edges of the cake are set and the center is only slightly jiggly. Invert the ramekin onto a plate, top with ice cream, and serve. Totally going to make this for me & the wife soon! I need to dive into this sweet dream stat! Mmmm, you had me at molten. 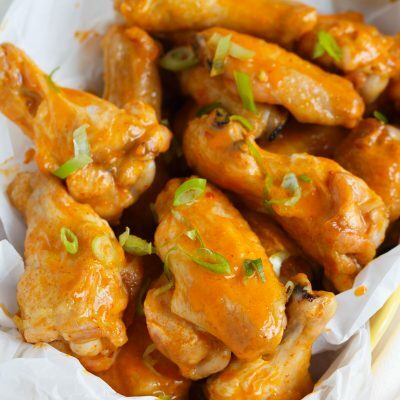 :) These look wonderful! And I can’t wait to see Unbroken too! 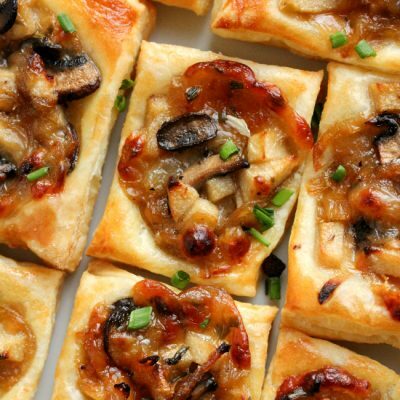 these look so decadent and delicious! 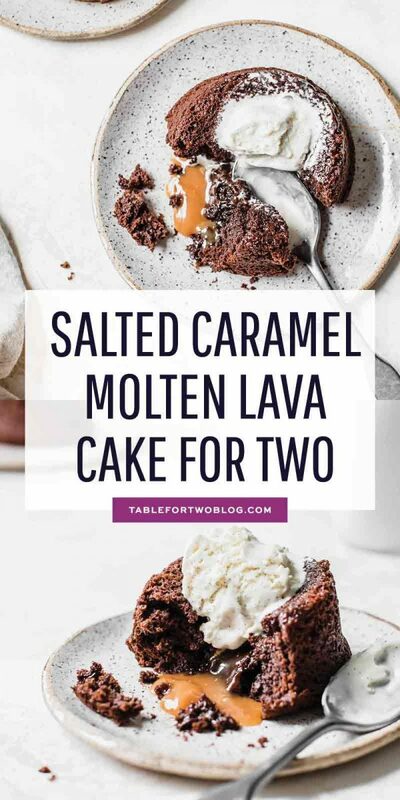 Two teaspoons of caramel in each lava cake or one teaspoon in each? Hi sorry, 1 teaspoon of caramel in each lava cake. Oh man these sound delicious. 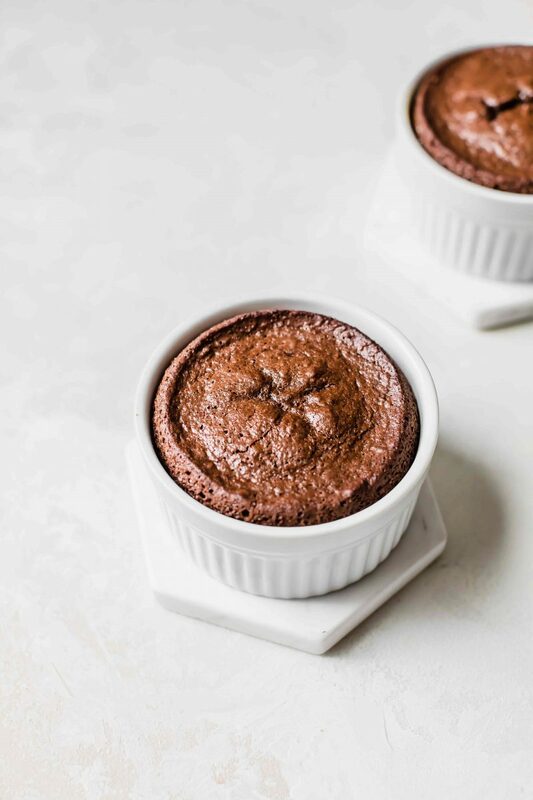 I love chocolate lava cakes! Salted caramel + chocolate = THE BEST. Love these little cakes! Wow. So decadent and delicious! One for me, and one for me. Yeah, I’m not sharing these when I make them. Totally sin worthy!! I love these Julie! Are you sure it’s only a teaspoon of caramel for each? That’s not much. Yup, positive. You’re welcome to add more if you don’t think it’s enough. Made them for my wife on Valentine’s Day and making them again. The Salt Carmel Sauce is good by itself. Awesome! So glad you guys enjoyed this! Hi! I want to make this for a nice dessert for my boyfriend, but he doesn’t like dark chocolate. Can it be made with milk chocolate chunks? Yep, any kind of chocolate chip is fine. Hi Julie. Could these be microwaved like your other mug cakes? omg Julie I need this right now! !